Polaris India unveils new Indian Springfield. Bookings open from April 15th and delivery commencing from August 2016. Polaris Industries Inc., the world leader in off–road and All-Terrain Vehicles, announced the launch of all new 2016 Indian Springfield on 15th April 2016. Having as a name after the place of birth of Indian Motorcycle and outlined the design for a genuine cruise riding experience. 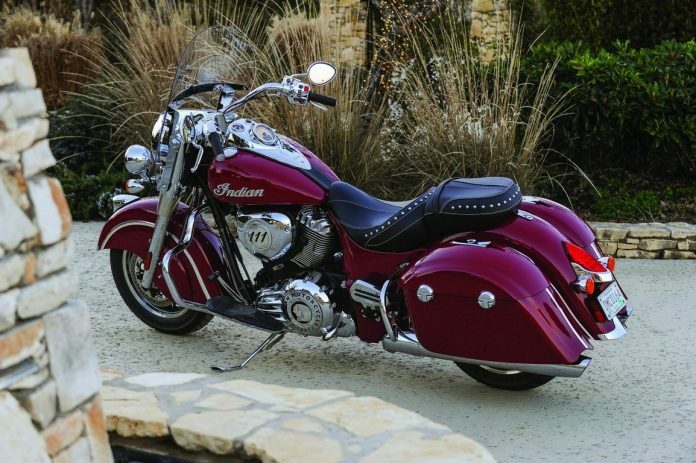 The Indian Springfield countenance a classic traditional style, quick release windshield and all weather, remote locking saddlebags. It’s outfitted with the most fundamental touring features but designed for ultimate versatility. Volvo Cars New Target to Sell 1 Million Electrified Cars by 2025. Indian Springfield with its classic styling bent with thoroughly modern technology for a purist’s take on both touring comfort and urban versatility. The all new intention built chassis carry unmatched handling and balance even when fully loaded with authentic Indian Motorcycle Accessories. Indian Motorcycles Company, Indian Springfield ‘Glory in the ride’ is available for its booking at Chennai, Bengaluru, Mumbai, Hyderabad, Ahmedabad, and Gurgaon. According to the press release Mr. Pankaj Dubey, Managing Director, Polaris India Pvt Ltd., the Indian Springfield was built to fill the hearts of riders who value rich heritage and beautiful craftsmanship of Indian Motorcycle. The Indian Motor Cycle Company unveils the Indian Springfield specification with its displacement of 1811 cubic capacity, closed fuel injection, engine type – thunder stroke 111, brakes accompanying with floating rotor and piston calliper. It can deliver 138.9 Nm of torque at 2,600 rpm. Springfield released with two variant of colour; Black & Red with ABS, Cruise Control, Keyless Start, Tire pressure monitoring, quick release hard saddlebags, and quick release Lexan windshield.